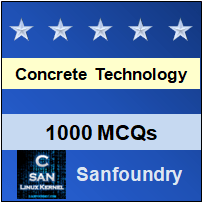 This set of Concrete Technology Multiple Choice Questions & Answers (MCQs) focuses on “Ultra High Strength Concrete”. Explanation: Ultra-High Performance Concrete (UHPC), also known as reactive powder concrete (RPC), is a high-strength, ductile material. Explanation: The material provides compressive strengths up to 29000 pounds per square inch. Explanation: The material used for UHPC provides flexural strengths up to 7000 pounds per square inch. Explanation: 45-50 GPa or 6500 to 7300 ksi is the range of modulus of elasticity for ultra-high performance concrete. 5. What is the compressive strength for UHPC? Explanation: 28 days compressive strength for UHPC is 100-150MPa and for HPC, it’s 60-100 MPa. 6. “Where the matrix is extremely dense, a weak aggregate may become the weak”. Is this statement true or false? Explanation: For very high-strength concrete where the matrix is extremely dense, a weak aggregate may become the weak link in concrete strength. 7. What is the percentage of water by weight in UHPC? Explanation: 4.4 is the percentage of water by weight in UHPC according to typical composition of Ductal. 8. What is the percentage of PC by weight in UHPC? Explanation: 28.5 is the percentage of PC by weight in UHPC according to typical composition of Ductal. 9. What is the percentage of steel fibre by weight in UHPC? Explanation: 6.5 is the percentage of steel fibre by weight in UHPC according to typical composition of Ductal. 10. What is the percentage of accelerator by weight in UHPC? Explanation: 1.2 is the percentage of accelerator by weight in UHPC according to typical composition of Ductal.